We have a couple of birthdays in our family this month with the youngest member turning 2. Of course that requires a hand made card from Grandma! This little sweetheart of ours is a real little character - she is going to be a great artist and she spends hours drawing and singing at the same time. I used one of the Painted With Love Specialty Designer Series Papers combined with Rich Razzleberry & Pink Pirouette card stock and some Gold Glimmer paper to pick of the gold foil in the paper. The balloons are a retired Stampin' Up! punch and the textured card is created using one of the Petal Pair Embossing Folders. 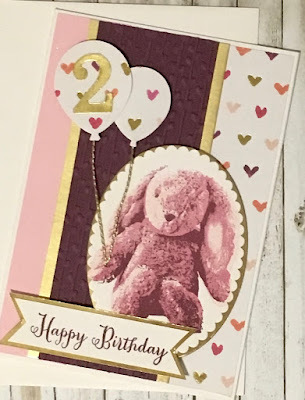 I used the fabulous Stampin' Up! Stamparatus to align the 3 stages of stamping the bunny. This tool makes it so easy and will be available in our new Annual Catalogue due out in June. Just a quick post today as we are busy with family "things" this week. You'll find a list of products below. Please go to my on-line store if you'd like to purchase any Stampin' Up! products.